Some would argue that golf ruins a perfectly good walk. Others not so much as fanatical golfers flock to Australia in seek of the perfect round. Australia, amongst its other delights features some of the best courses known to mankind. No need to worry about sharing the course with hundreds of other golfers as per capita, Australia has the highest amount of courses in the Southern hemisphere and Tasmania has the highest in the world. Impressive stuff alright. Here are my top 5…. Tasmania is well known for its splendid wilderness, pristine coastline, cool climate wines and fresh local produce. Situated in the North East corner of Tasmania is Barnbougle Dunes, a stunning links Golf Course carved out of an extraordinary landscape. The challenging course reminds players of Scotland and Ireland with its wide open fairways and challenging hole layouts. Breathe in the cool Tasmanian air while listening to the sound of crashing waves. Combine a visit to Barnbougle with an exquisite food and wine experience. Dent Island sits opposite the world renowned Hamilton Island in the Whitsunday Passage. The course is said to be one of the most challenging in the world, designed by 5 times British Open winner Peter Thomson. (I lost 24 balls on this course but found 25!!). The layout takes full advantage of the rugged topography using the ridges and gullies to create a stunningly scenic masterpiece. Despite its challenging nature, I personally found playing golf here one of my highlights of a recent stay on Hamo. The scenery alone is well worth the visit and relaxing in the clubhouse afterwards with a couple of drinks and good friends was priceless. Opened in 1928, New South Wales Golf course is one of Australia’s oldest courses. Located just 15 minutes south of the city at the stunning La Perouse, the course is situated amongst native plants and sand hills on the shores of the Pacific Ocean and close to Botany Bay. It is simply one of the most spectacular courses in Australia. It is a links style course featuring challenging fairways and small greens. In fact the famous Australian Golfer Greg Norman is a member and rates it as one of his all time favourite courses. The championship course is private and you will need assistance getting on for a game. It is worth the effort though as you will not be disappointed. Located just 20 kilometres from the city on the stunning Northern Beaches, Long Reef Golf Club enjoys a commanding beachfront position and boasts spectacular views of the Pacific Ocean. 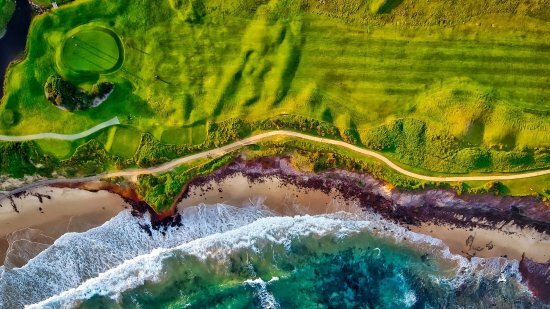 Long Reef has a well-earned reputation of being one of Sydney’s best golfing layouts and in fact one of Australia’s greatest golfers and course designers, British and Australian Open winner Peter Thomson, rated Long Reef as “the best site of any golf course in Sydney. Long Reef regularly is chosen as a qualifying course for Australian and State Professional and Amateur events and the immaculate Kikuyu fairways and fast Poa annual greens are well respected by golfers of all standards. The Royal Melbourne Golf Course has a reputation of renowned hospitality and providing world class facilities. Located just minutes from the centre of Melbourne, The Royal Melbourne provides players with a unique and challenging course. It is rated in the top 10 golf courses in the world and is well known for hosting the 1950 World Cup of Golf using its composite course. If you are travelling to Melbourne and looking for a round, The Royal Melbourne is a must. It is also a private course so you will need assistance to book a tee time. If you want to include a round of golf on your next Australia vacation, let us organise the perfect day out. You don’t even need to travel with your clubs, we can organise all this for you. 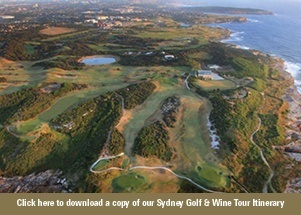 Click on the link below to view our “Golf and Wine Tour” we developed for those visiting Sydney. We can replicate a simlilar experience in each location throughout Australia.